The guessing game of when your Android handset will get updated to Ice Cream Sandwich just came to an end for those folks on Bell up in Canada. 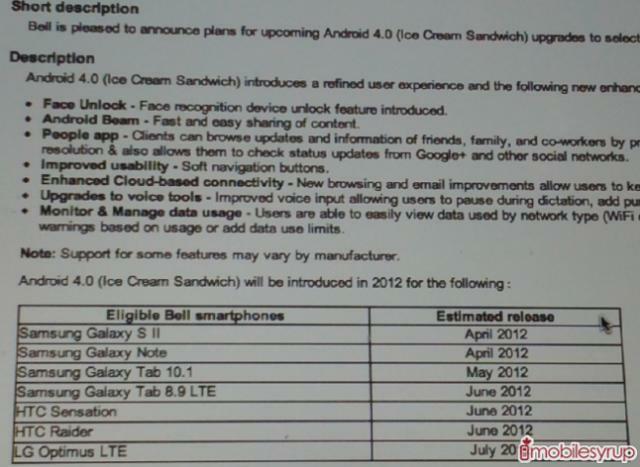 Despite having been announced last fall, Ice Cream Sandwich updates have been slow coming for a lot of handsets. Sadly carriers have also been a bit lax in letting their customers know when they can even expect it. For those of you on the Bell network in Canada, however, Mobile Syrup got its hands on a leaked timeline last night that tells owners of seven different devices when they can expect the update. Of course target dates can shift, and just because you see a device listed there that you may have with a different carrier (i.e. the Galaxy Note with AT&T in the states), it doesn’t mean that you can expect to see them at the same time. The speed with which ICS updates are rolling out does appear to be picking up some speed, however, so hopefully there will be a lot more announcements like this for other carriers in the not so distant future.